Well, that settles it: The Columbus Blue Jackets will not be sellers ahead of this season’s trade deadline. Despite a 6-8-0 slide that has pushed them down to third in the Metropolitan Division, they acquired center Matt Duchene (58 points in 51 games) from the Ottawa Senators on Friday in exchange for a package highlighted by a 2019 first-round pick and a conditional 2020 first-rounder. At this point, it would make absolutely no sense for the team to move pending unrestricted free agents Artemi Panarin (67 points in 57 games) and Sergei Bobrovsky (2.82 GAA, 90.6 SV%). Bringing in yet another UFA is certainly a massive gamble, but general manager Jarmo Kekalainen’s thought process is understandable. With Duchene in the fold, this is without question the strongest roster in Blue Jackets history. It now boasts two legitimate top-six centers (Duchene, Pierre-Luc Dubois), two top-pairing defensemen (Seth Jones, Zach Werenski) and an elite offensive threat on the wing (Panarin). Beyond the main figures, there’s a nice mix of finishing ability (Cam Atkinson, Josh Anderson), experience (Nick Foligno, David Savard) and grit (Boone Jenner). Does Duchene’s arrival push them to the head of the class? Probably not, but this is a squad that looks prepared for postseason hockey. Moreover, this move aligns with head coach John Tortorella’s shelf life. Longevity is an issue for all bench bosses. However, Tortorella lives on the more abrasive side and is therefore likelier to be tuned out by his players. While his resume is solid, he wouldn’t be anyone’s first choice to coach a rebuilding squad. He wants to win now and his GM has offered him a shiny new toy to achieve just that. The timing of this deal works for the player in question too: Duchene is enjoying the best season of his career and is surely relishing the chance to carry that momentum into the playoffs. He has suited up for a total of eight postseason contests across 10 pro seasons. Suffice to say he’s hungry to prove his worth on the big stage. With his combination of high-end speed and elusiveness, the 28-year-old pivot is a playmaking jitterbug on the ice. He possesses good vision and a great release, and he showcases those traits at a high tempo. His standout trait may well be his edges, though, as he can change directions on a dime and create separation down low like few other forwards in the league. That knack for extending possessions wears out defenses and generates opportunities that wouldn’t exist otherwise. Since Duchene has regularly outperformed his club in shot and goal shares at 5-on-5, Columbus is adding a dynamic center who can tilt the ice for his teammates. He also represents a serious upgrade over Alexander Wennberg (23 points in 59 games). The 24-year-old posted 59 points in 80 games two seasons ago, but he appears lost in his head at the moment. The creativity and passing touch have seemingly vanished. Maybe he doesn’t fit in Tortorella’s system. At any rate, he ranks near the very bottom among Blue Jackets forwards in SCF% (47.6) and GF% (46.4). Duchene should step right into the lineup and provide the boost Wennberg could not. The pressing issue now is whom Tortorella should partner him with. Thanks to Panarin’s brilliance and Dubois’ emergence as a young star (51 points in 59 games), Columbus has one of the finest top lines in hockey. Even if you believe Duchene is better than Dubois in a vacuum, there’s no reason to break up a good thing. After all, Panarin, Dubois and Atkinson have produced a 53.9 CF%, 55.9 SCF% and 57.0 GF% while facing the opposition’s best every night. 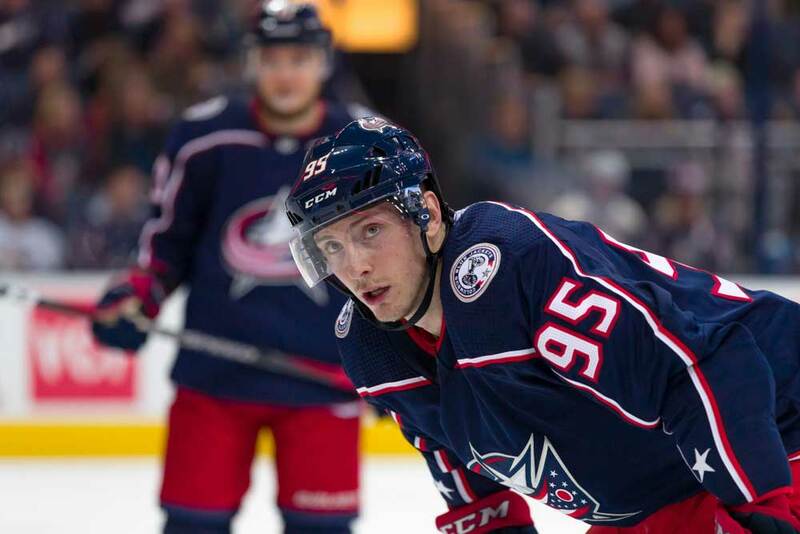 Columbus opted to put all of its eggs in one basket on Friday night, as Duchene debuted alongside Panarin and Atkinson. The three didn’t produce any goals, but they did generate a slew of chances (76.9 SCF%). However, this came against a woeful Senators roster that has given up on the season as it awaits the fate of UFAs Mark Stone and Ryan Dzingel (now traded to CBJ also). An AHL team would have offered up more resistance. The Blue Jackets’ next two contests (vs. San Jose and Pittsburgh) should provide a more accurate indication of how to configure the lineup. Considering Dubois’ chemistry with his full-time linemates and the price paid for Duchene’s services, the latter should be tasked with driving his own unit and creating a true two-headed threat down the middle. Two of Anderson, Foligno, Jenner and Oliver Bjorkstrand (21 points in 55 games) would make for solid linemates. Perhaps Wennberg could even move to the wing. Anderson is the most intriguing pairing for Duchene. The 24-year-old power forward has a nose for the net (22 goals in 60 games) in addition to great wheels for a big man. He could stand to use his 6’3”, 221-pound frame more effectively in the corners, but that’s where Duchene’s puck control in close quarters would come in handy. Opponents are routinely mesmerized by the center’s skating displays, which would open up the ice for a competent finisher like Anderson. Both are quite dangerous on the rush too. No matter how the lines shake out, Columbus is clearly better equipped for a playoff run now. It’s deeper and more experienced than a year ago. The offense should produce at a higher rate and control more of the play, which will then make life easier for the blue line and Bobrovsky. On the flip side, this move comes with a spectacular amount of risk. There’s a distinct possibility that the team loses Duchene, Panarin and Bobrovsky for nothing in free agency. If the Blue Jackets hadn’t acquired the center and moved their pending UFAs, they could have entered the offseason with three first-rounders, solid prospects and major cap space. There are already strong building blocks (Jones, Dubois, Werenski) in place, and they’d be young enough to remain core members by the time the futures developed. Since there’s every reason to believe Panarin and Bobrovsky will take their talents elsewhere, Columbus may well pay for its impatience. With that said, this franchise has never advanced past the first round. Getting over that hump alone would represent a high-water mark…and maybe that’s the real impetus behind the trade: just reaching the next stage and instilling a greater level of belief in the players who remain after the dust settles. Championship or not, Columbus is all in. This is a one-year charge to change its culture.